In a few short years we will be buying mattresses that are themed for 9/11—and guzzling Cokes in memory of 9/11. This is true. It is a fact. How do I know we will reach this advertising gutter? Because this year, on the 15th anniversary of the terrorist attacks on America, the first wave of tasteless advertising appeared. 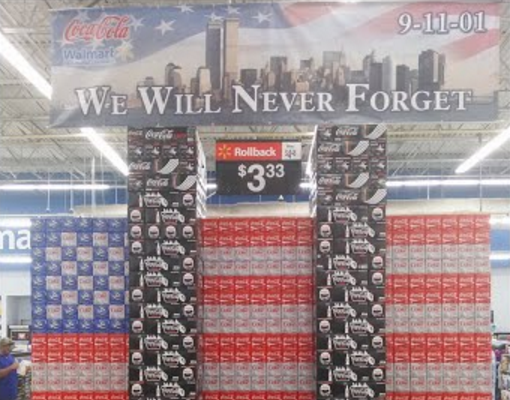 To wit, in Florida, a Walmart had a breathtaking display of Coke Zero (get it…Ground Zero?) that re-created the two World Trade Center towers. And there was apparently an American flag made of Coke, Diet Coke, and Sprite boxes. A sign above the display said, “We Will Never Forget.” Classy. And a store in Texas released a television ad promoting a twin (get it?) mattress sale. The ad ends with (and one cannot make this up), the staff in the store falling over the two mattresses, topping them down. Sadly, harbingers of what’s to come. No matter the Walmart apology and the owner of the mattress store not only apologizing but shutting the store. Harbingers because words and phrases are meant to convey emotional connections to the audience and what is tasteless to some is a fantastic selling pitch to others. In 1979 we almost had a nuclear disaster here in this country. A nuclear power plant on Three Mile Island in Pennsylvania experienced a partial nuclear meltdown. In other words, we almost suffered, on the East Coast, an accident much like that in Chernobyl. But, by luck or industrial design, we did not. But we did suffer through a rash of ads announcing sales that were “radioactive;” I remember them. A quick look on the Internet draws a blank, but I remember the tongues wagging how tasteless. Lots of publicity; but today there is no harm in calling a sales, or a promotion, radioactive. Need more proof? Been to the theater to see a ‘blockbuster’ play? Tickets hard to get? And how Americans bought movies at the chain store “Blockbusters?” Don’t remember any pickets? Sure, no one cared that “blockbusters” was introduced in the language from World War II. These were bombs that could destroy a city block. (Get it?) Destroy buildings. Kill civilians. They were incredibly destructive; they were “blockbusters.” The Brits used these bombs, some of which weighed more than 4,000 pounds. The German citizens were apparently the first to call them blockbusters. Soon enough, some copywriter in the 1940s thought to have sales described as ‘blockbustes’. Soon enough, Broadway proudly advertised a hit play as a ‘blockbuster.’ By 1954 a “block-buster” movie was one grossing at least $2 million dollars. No one objects today to the use of a catastrophic weapon to describe an unsuccessful move. And, soon enough, in a few short years, we will all be standing on line to buy some sort of “twin” products with “falling” prices on September 11th. Soon enough, no one will bat an eye. It is the nature of who we are. Growing up in New York I realized that the world was a bewildering kaleidoscope of people. How cool. I wanted to observe and understand more. Still do.